Destiny of the Shrine Maiden 2 - "Overlapping Sun and Moon"
This episode opens with Chikane pouring cold water over herself. She's still ruminating the kiss from the last episode. She can't get the thought out of her head. And neither can Himeko. We see her dreaming about it, unsure if it really happened or not. She wakes up in Oogami's home with Chikane by her side. They are summoned by Oogami who informs them that they are priestesses. Banner Art: “Shingeki no Kyojin - MikaxAnnie Agony” by RowenaJackson. 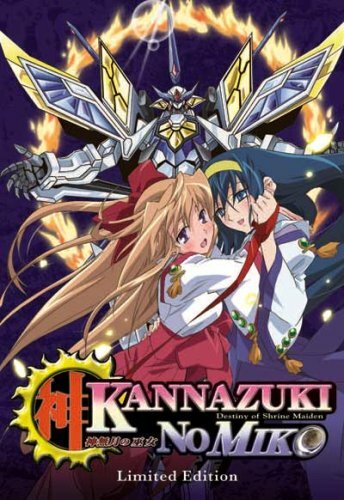 Chikane is the priestesses of the Moon, and Himeko is the priestesses of the Sun. And Souma, he's a child of Orochi. The Orochi are the ones responsible for all the sudden chaos. Meanwhile, Himeko tries to visit her friend Mako in the hospital but their relationship isn't what it used to be. Later, a horny Orochi attacks the girls and Souma comes to help them fight it. Then we finally get to more of that neat mecha action! Destiny of the Shrine Maiden 3 - "Secret Love Shell"
Destiny of the Shrine Maiden 1 - "The Land of Eternity"